The trader said this little hunting bear is serpentine, however that seems unlikely. I found two references that label similar dendritic stone as Biggs jasper. Normally Biggs has elegant swirling landscapes in dark brown and buff colors, but some of it also looks exactly like this. Or it might be more common dendritic dolomite. One might guess that the black dendrites on the bear's back were fossil plant material but in reality they are manganese oxide which forms plant-like shapes in many different types of rocks. There is a gorgeous photo of dendrites in a more typical example of Biggs jasper in Within the Stone. In the accompanying essay, Andrew Revkin remembers sailing up the Red Sea in a similar landscape and found, "Each wet, wind-blown grain was a tick of God's clock." If you love stones and/or flights of fancy I feel confident you would LOVE this book (see below for an amazon.com link to it). Cushing's 1881 treatise on Zuni fetishes discusses several aspects of bear including this, "In ancient times, while yet all beings belonged to one family, Pó-shai-aŋ-k'ia, the father of our sacred bands, lived with his children (disciples) in the City of the Mists, the middle place (center) of the Medicine societies of the world. There he was guarded on all sides by his six warriors, Á-pi-thlan shí-wa-ni (pí-thlan=bow, shí-wa-ni=priests), the prey gods; ... toward the West by the Bear Clumsy Foot);..." McManis claims the bear is one of the most important fetish animals throughout the Southwest, he also places it in the west as one of the protective and healing animals. Because of its position in the west and bear's semi-hibernation behavior, Medicine Cards give the bear "introspection." There is already a great deal on my site about aspects of bear, about the need for people with bear totems to take time for reclusiveness and to emerge to bring forth the babies born in the den and to seek the honey of life. (Please use the search feature on the Virgo Moon home page to find other bear essays and work which includes bears). In seeking bear meanings from other cultures, I found one image of a Syrian bear in the Egyptian tomb of Rekhmire in Gurna (18th Dynasty). The bear is collared and on a lead held by a Semite in a long tunic. An Egyptian Bestiary mentions that exotics like this poor bear were alien to the Nile Valley, were not domesticated by the Egyptians and did not influence the close relationship that the Egyptians enjoyed with native fauna. But the image points us to the Old Testament for wisdom about the Syrian Bear. Two points stand out in Rev. Wood's wonderful Bible Animals. One is that young Syrian bears are dark brown and their coats gradually lighten as they age. That would make this little bear a mature adult. The other emphasis in Biblical texts is the fierce retribution of bear, especially of the female protecting her cubs. In Proverbs 17:12 Solomon warns: "Let a bear robbed of her whelps meet a man rather than a fool in his folly." The Druid Animal Oracle assigns the attribute "art" to bear. It says, "Art connects you with the very deepest of your ancestral roots. Here, at this level, you are in touch with the Primal Mother--the Bear goddess Artio... also with the Bear god Artaois..." I could go on and on about Bear, but perhaps this has been more than enough to whet your appetite for learning about Bear. A bit about the other aspects of this necklace: the spacers are fabricated from sterling to hold a pair of fossil clam shells. Clamshells have been highly prized since earliest times. 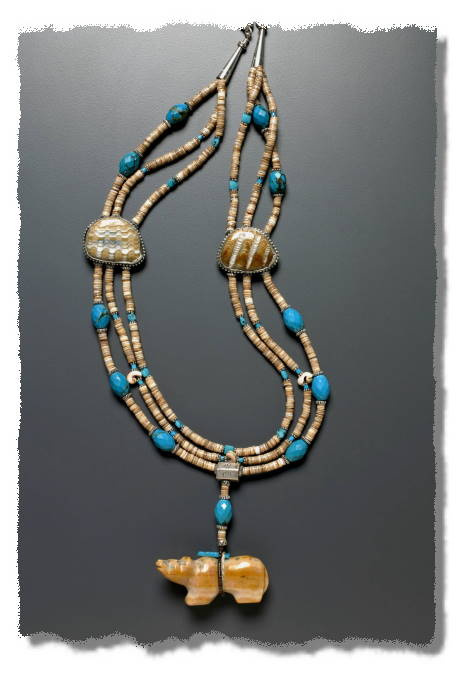 North American Indian Jewelry and Adornment offers some beautiful examples of clamshell beads. These fossilized examples retain the wavy pattern of the clam, now replaced with gorgeous mineral deposits. 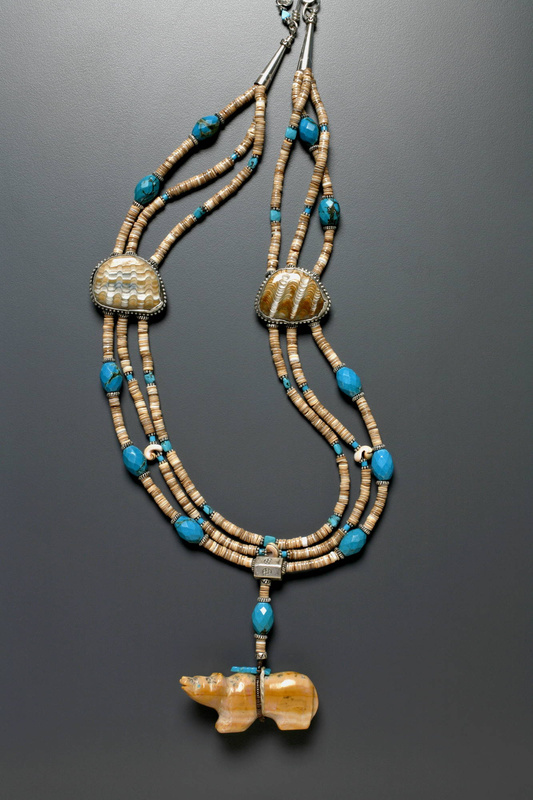 The necklace is primarily Voluta shell heishi and shell heishi has long been used by Native Americans. Both Collectible Beads and The History of Beads give many pictures of seashell beads. The latter has a most amazing photo of a burial in which a skeleton lies on a bed of thousands of shell disk beads mosaiced into the shape of a hawk. Given the difficulty of shaping and drilling shell beads in antiquity, the care and work involved in producing the extraordinary mosaic is difficult to comprehend. To return to our subject, this little bear is in hunting (head up) pose with a sweet expression, inlaid turquoise eyes and offering bundle. Right now he is hunting for a loving home. Won't you adopt him?